Mila was independent female who knew her value. She had strong prey drive, high tendency to aggressive behaviour and high desire for defence action. As a young girl Mila was reserved against strange people, but later she jumped straight into arms and gave kisses. We competed in many species, from which messenger dog trial was the best for her because Mila loved to run. Unfortunately Mila always suffered so called "2nd dog syndrome" caused by Cino and somehow we never were in the same level, but anyway we made many working results together. 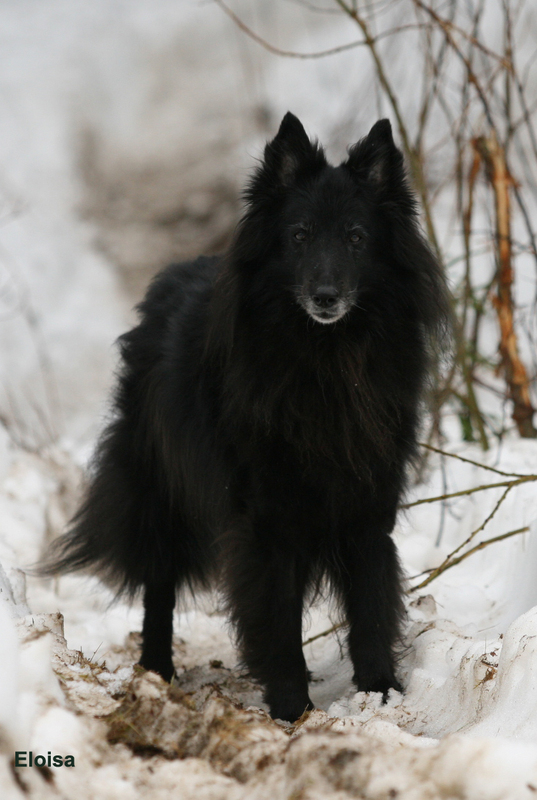 Mila was co-ownership dog and she had two litters for kennel Wintergame: L- and M-litters. Also kennel Willow Creek wanted to use Mila for breeding and she was mother for Willow Creek E-litter. As a mother Mila was more than perfect, tooking care of puppies as well as a dog can do. With Mila I also had made my dreams come true to follow the life of puppies, how they were born and grown up. Mila wasn't easy dog to train so that's why I learned a lot from her. With Mila I also learned a lot of hard breading world which gave to me a lot of experience. Dog who never need to butter up anyone! Thanks Mila, you gave and taught me so much!! General impression 1 (sufficient) Watchful and attentive, should be more self-confidence and straight. Accessibility 1 (sufficient) Is not open and free but can be touched. Desire for fight 2 (good) Fights eagerly, but uncertainly. Desire for defence action 2 (good) Defences powerfully, but is afraid. Reacts slightly for first shot, controlls her nerves sufficiently. 13 1 1 1x1. ja 1x3. 6 2 2 1x3. Silver in district championships of Satakunta 2004.